Sure Grip Ambi ERGO Grip for the AR. 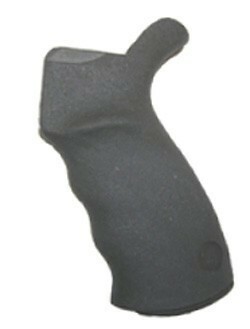 Ergonomically designed grip is comfortable and prevents fatigue. Sure Grip is our rubber overmolded grip. Molded from advanced space age polymers, the ERGO Grip is extremely durable. Rear upper extension supports the web of the hand and aids in control of the weapon. Ambi has no thumb shelf on the left side and allows for a comfortable grip right or left handed or used as a vertical forend grip/stabilizer.